"...The show’s great asset is Davis — she’s an enormously empathetic performer who clearly figured out that if we don’t care about her Halo, then the whole show goes nowhere. And care we do, not least because Davis shows us a buffeted but nonetheless open-hearted young woman who, despite appearances, really is on one of those relentless searches for peace with which most of us can empathize. This really is a very complex performance — nicely supported by Forman, who’s all-in (and those words mean far more in this show than is typical), and by Kim Boler, who plays Halo’s sister, Brinn." "...Can a woman really punch her way out of life's problems? As Halo herself admits to her sister in their most heartfelt conversation, the ring is the one place where she feels she can actually win. That feeling, however fleeting, may be enough fuel to keep one going. Elizabeth Laidlaw directed." "...I am not one that is crazy about sports that also purpose themselves as art and kick boxing and Martial Arts in general are “the art of self- defense” and of late a sport. I recall going to one of the Indiana casinos to watch a match in what appeared to be a cage, and was somewhat repulsed at the idea of tossing two men into a cage and having the survivor walk out. It kind of goes back to a time where the Gladiators were the powers. I do have to say that although the latest production by Broken Nose Theatre, “Girl in the Red Corner” does get into this form of “art”, the story involving the character(s) is powerful and the cast assembled for this 100 minute production is superb ( and very fit)." "...Stephen Spotswood’s “Girl in the Red Corner” is fast-paced. A tight hundred minutes with a brief intermission and the scene work follows suit: no air between lines or punches; no time to think. Mid-aughts alt-rock leads transitions. It’s entertaining, and the politics of femme anger and conflict are nothing to turn your nose up at. As Broken Nose Theatre’s artistic director, Elise Marie Davis, notes in the program, all those fight-y plays we’ve seen in the last few years (Red Theater’s “Chad Deity,” the Neo-Futurists’ “Seven Fights,” Victory Gardens’ “Sucker Punch”) are really dude-heavy. So, yeah. It’s a femme and non-binary fighting show." "...This show will inspire you to fight back… against a bad relationship, a crappy job, a life that has let you down. GIRL IN THE RED CORNER is a powerful tribute to change." "...Before I knew anything about Girl in the Red Corner, a play running through March 2 in an upstairs studio at the Den Theatre in Wicker Park, I thought it might be about communism, a female spy backed into a metaphorical corner in Moscow or something. That could be an interesting show, but, as it turns out, that’s not at all what Broken Nose Theatre’s production of this Stephen Spotswood play is about. Which is probably for the best, as what it is about—a newly divorced, working-class woman who finds purpose and a sense of self in mixed martial arts training—is ultimately much more interesting." "...John Tovar's intricately-choreographed combat makes for spectacle as graceful as it is brutal, while Elizabeth Laidlaw (whom playgoers may recall playing Warrior Princess Xena in About Face Theater's 1999 parody of the action series) ensures that we savor the tenderness as well as the toughness in Spotswood's parable of female empowerment." 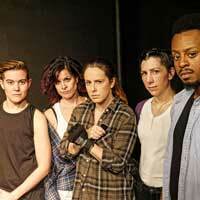 "...Director Elizabeth Laidlaw introduces the production by walking onto the mat that stretches across the stage. She has her heels in her hand. This image is striking and gives a glimpse into what this play is about. Women in a space dominated by men. With so much going on, Laidlaw puts focus on characters that get back up. Terry, Brin, Halo, and Gina all get their chance to forge ahead. The script is incredibly eventful, but every audience member will find a way to connect with this story, no matter what battles you may be fighting."